You're either reading this because (1) you've just got a new tattoo or (2) you're thinking about getting a tattoo. 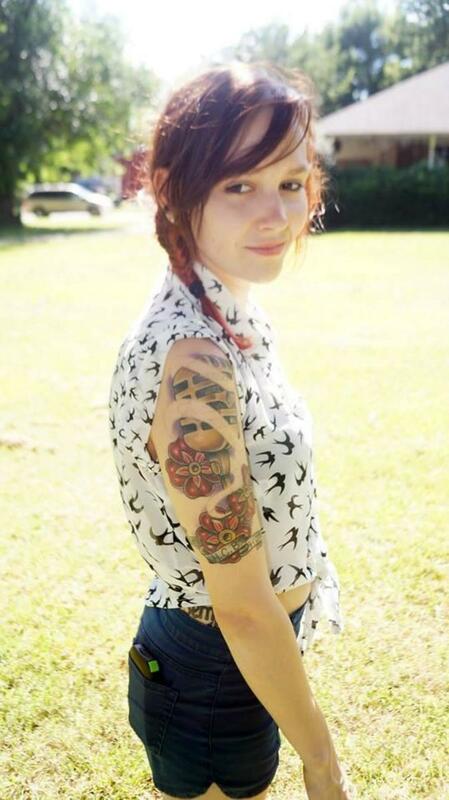 Either way, you must remember that tattoo aftercare may vary from person to person and artist to artist. 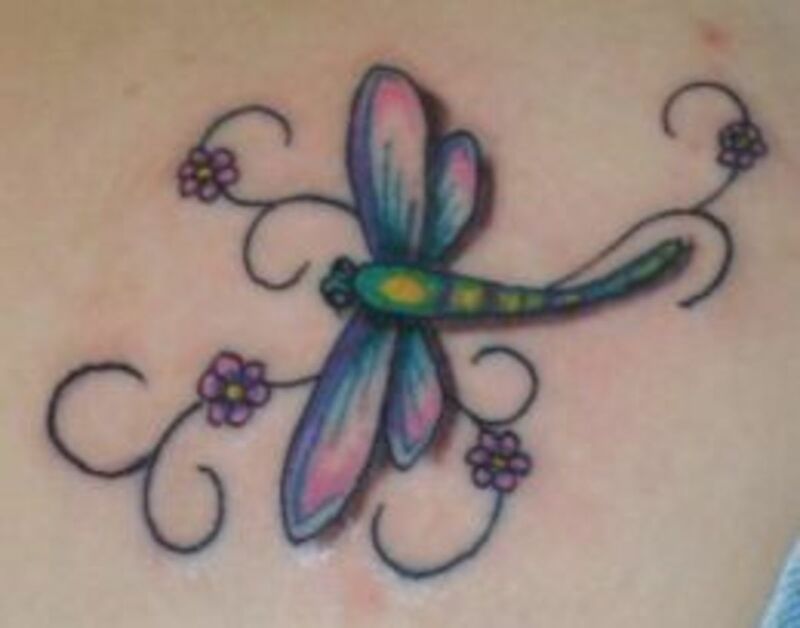 Usually, your tattoo artist will give you written instructions as to how to properly care for your new tattoo. But, it's best to be prepared and to know what you're getting yourself into when you get a tattoo. A tattoo is a puncture wound that is made deep into the skin, filled with ink. Tattoos are made by penetrating your skin with a needle and injecting ink into the area, which usually creates some sort of design. What makes tattoos so long-lasting is that they're deep; the ink isn't injected into the epidermis (the top layer of skin), but the dermis (the second, deeper layer of skin). Dermis cells are very stable, so the tattoo is practically permanent. In the beginning, tattoos were done manually, in which the tattoo artist would puncture the skin with a needle and inject the ink by hand. Although, this technique is still used in parts of the world, most tattoo shops use a tattoo machine, which is a handheld electric instrument that uses a tube and needle system. On one end of the machine is a sterilized needle, which is attached to tubes that contain ink. A foot switch is used to turn on the machine, which moves the needle in and out while driving the ink about 1/8 inch (about 3 millimeters) into your skin. Your tattoo artist will know how deep to drive the needle into your skin, as not going deep enough will produce a poor tattoo, and going too deep can cause bleeding, intense pain, and scarring. 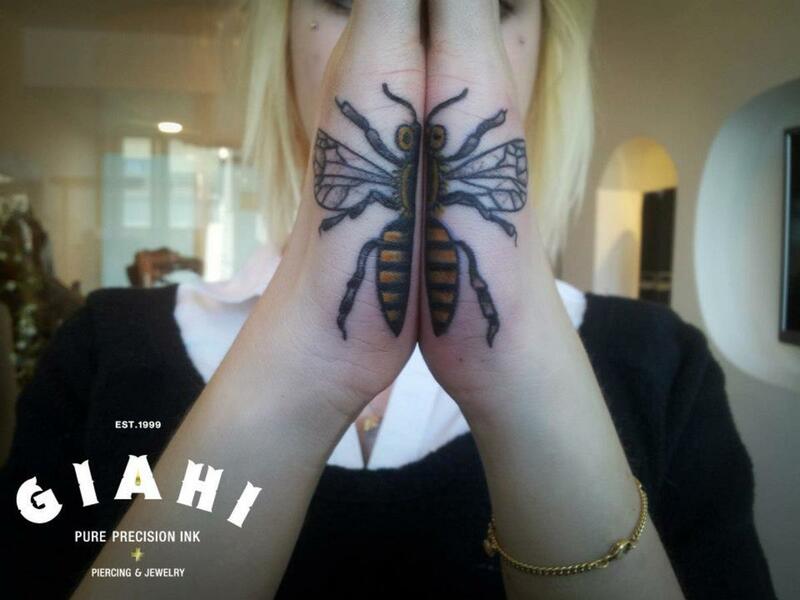 You will find that complications related to tattoos will generally depend on amateur artists, do-it-yourselfers, and informal tattooers; remember that just because a tattoo shop is in business and has customers and employees, it doesn't necessarily mean that they are clean, sterile, and reputable. I advise that you strongly consider the following tattoo aftercare tips and advice because if you don't care for your new tattoo properly for the first two weeks, or so, you have a higher risk of infection and scarring. 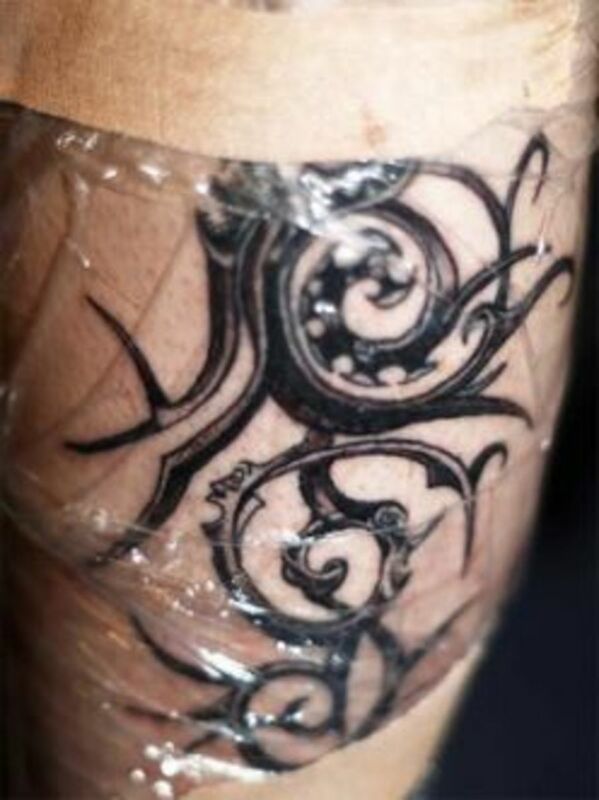 Depending on the size of the tattoo and your tattoo artist's advice, you should leave the bandage on the new tattoo anywhere from 2 hours to overnight. Typically, you want to remove the bandage when you get home, so that you can let the tattoo breath, but if you are still bleeding you may consider gently dabbing the new tattoo with a new paper towel so that the blood doesn't pool. When removing the bandage, do so gently by slowly peeling the bandage. If it sticks at all, STOP! Pour cool water between the skin and gauze. Make sure that you don't stick your tattoo under a full force faucet; remember easy does it. Wait a few minutes, and try to remove the bandage again. The cool water should loosen your skin from the bandage without yanking any color out. Do remember throughout this, to not pull any skin or scabs off the tattoo, as you could pull out the ink, which can result in uncolored or dull gaps in your tattoo. Once the bandage is off, wash the tattoo very gently with your fingertips. Use a mild antibacterial soap or any other gentle soap that is free of deodorants, skin softeners, or other additives. After you clean the tattoo, gently pout cold water over it for a few minutes. The cold water will tighten your pores, which will help the tattoo heal healthily and quickly. 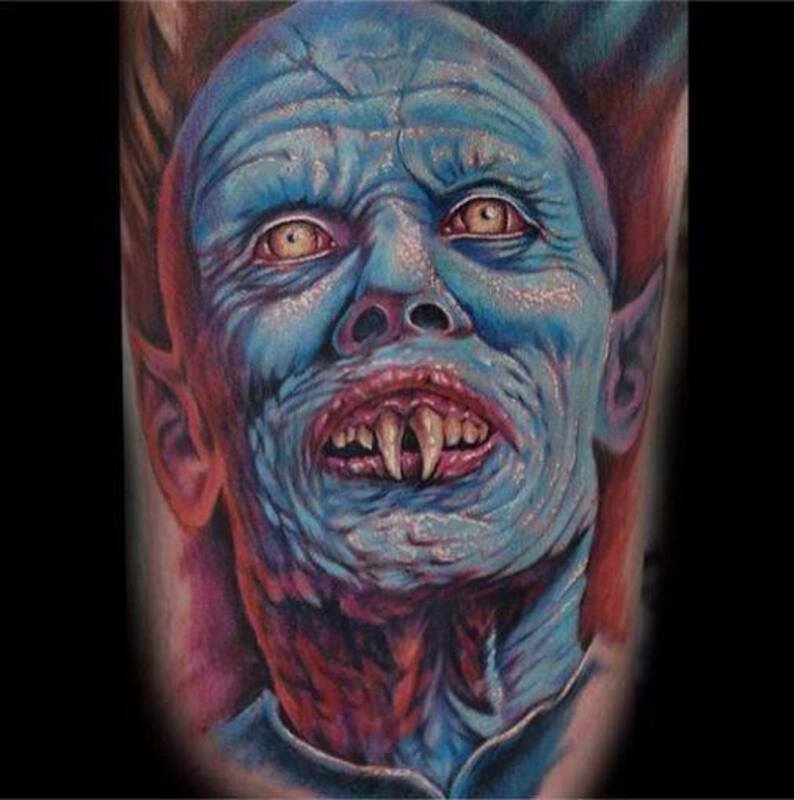 Some tattoo artists believe that the cold water helps the color set in. Carefully, apply a light coating of A & D ointment. DO NOT smear ointment on too thick because your skin needs to be able to breath. A small drop of ointment should be enough to cover the tattoo, depending on the size of the tattoo. Gently massage a small dab of the ointment into the tattoo using your fingertips. You can use Bacitracin or even a gentle additive free lotion as long as it is water based, such as Corn Huskers Lotion. But, since A & D ointment contains nothing but skin healing vitamins A and D, it's the ideal balm to use on a new tattoo. For the first two weeks after you get your tattoo, keep it away from water as much as possible. Use only your fingers to wash the new tattoo. And, blot it dry with a soft towel. Do not re-bandage a tattoo. Never use soaps with additives such as special scents, skin softeners, etc. Make sure to use water-based products, non-petroleum based. Never use loofahs, sponges, washcloths, cotton balls, paper towels, or anything else but your fingers to clean a tattoo. Do not put a new tattoo under a full force faucet. When taking a shower, don't let the water directly hit the tattoo. When taking a bath, don't submerge the tattoo in the water. Don't coat the surface of the tattoo too thick with ointment, as you will suffocate the skin, cause it to scab up and increase your risk of infection. No rubbing, scrubbing, picking, or scratching, no matter how much it itches! Once the ink has settled into your skin, you can return to life as usual. If you are going to be outside for any length of time, remember to always use a strong sun block on your tattoo, as the sun rays will fade the tattoo. Tanning beds, are not recommended, even after your tattoo is healed. 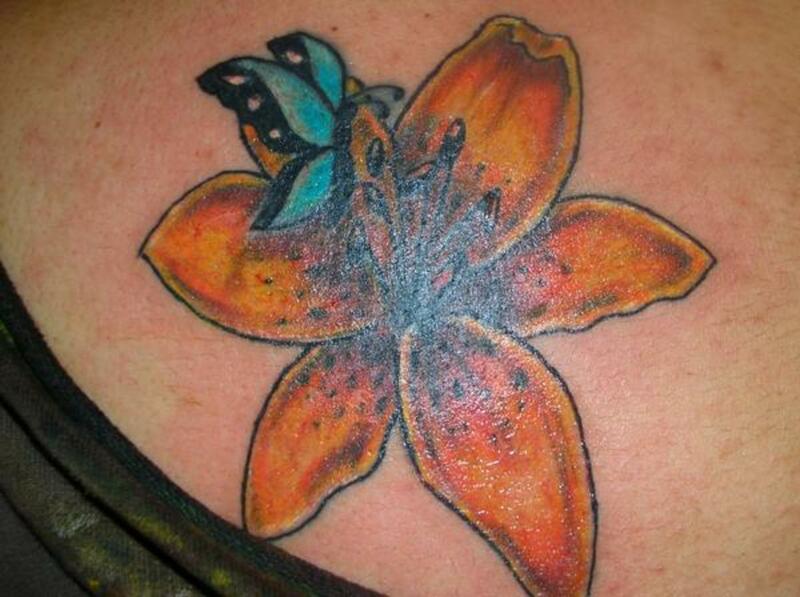 If you choose to go to a tanning bed, cover the tattoo fully. Also, just like the rest of your body, your tattoo will look better, longer, if you get into the habit of using skin lotions. After your tattoo has fully healed, if you are not happy with the way the tattoo looks (the color has gaps or is patchy), go back to the tattoo artist. As tattoo artists want to do the best job they can for you, most of them will be happy to do a touch up on the tattoo once it is fully set in. I'm considering getting a tattoo on my arm, this would be the first and so I wouldn't know how to care for it afterwards. This really did help and give me a better look on what I would need to do. The best thing to do when getting a tattoo on loose skin; so to say, is to make sure the artist moistens the area before starting. He/Should know how to inject the ink. If not, then they will more than likely go too deep. On tough area's of skin it is likely that the artist will try to adjust the setting of their machine. (it is not called a gun) *just slang... When treating the tatto, let it breathe for the first day/night, then Recommend COCO Butter for treatment, if alergic, Lightly rinse softly with water, If you use A + D .. make sure there is no Iron, Zink in it. Treat the tattoo with care and don't over use the water, or any other Moisturizer. Your tattoo artist should tell you what is needed.. IF NONE OF THE ABOVE DON"T GET ONE FROM THAT ARTIST... they do not know the right actions to take in pre-care or after-care. Have fun with your new tatto. and Good luck. @tiffany everyone is different when it comes to pain tolerance. i think the majority of the process is not an agonizing pain but more of a sensation(warm) if that makes sense. my experience was great and what you feel during the tattoo being done is not pain but more of a disturbance then anything. based on what u said the tattoo will not take too long(unless your hand is enormous) artists are usually good at making sure u are comfortable and that what they are doing is not hurting you. just don't get into your own head and enjoy the experience. don't let these people tell you how bad the tattoo is going to hurt. it depends on every person. i just got my first tat about a week ago on my back. it's a cross with wings and it runs straight down the spine. it ddnt really hurt it was more agrivating then anything. it mainly felt like i had a killer sunburn and somebody with a long thumbnail keeps scratching it. im getting 4 cat paw prints walking down my shoulder blade but kinder near my spine, this is my first tatt, im getting it on the 21st of oct for my 18th for my cat whom died earlier this year. my mum makes caring for tattoos seem easy, i didn't know you couldn't have water go directly on it.. showering seems difficult, guess i can always just face the shower but yeah i dunno. seeing as alcohol thins the blood, does that mean the tattoo will bleed? Wondering if tattoo will successfully cover spider veins or make them worse? I'm getting one soon in honor of my dad's recent passing. Anywhere in the wrist, back of palm area. And I have a very low pain threshold (the kind that needs flip flops while walking on the beach). Can I take anything before the procedure to minimize the pain like over-the-counter painkillers? Will it help? And does that area (wrist to back of palm area) hurt more or less than the other areas? Need your advice. Thanks! Going to get a tattoo on my calf. Has anyone else had this done. Wondering if a medium tattoo will take more than one sitting. I have two, one on the back of my neck and a few days ago had a half sleeve outlined and some sharing done. Painful? Yes. The upper sleeve hurt from 6/10 to a few unbearable parts (and I had my 3kids naturally, believe me I know pain.) It feels like a hot knife slicing through your skin over and over. Yet I will still get it finished, and likely get the others I planned on getting!!!!! I got my first tattoo on Wednesday, on my shoulder. I was just wondering when it would be ok to start showering normally again (as in letting direct water hit it)?? So I'm getting my first tattoo soon. I'm getting a Tribal down my right side. I know its a sensitive area.it starts from underneath my breast down to just about waistline. 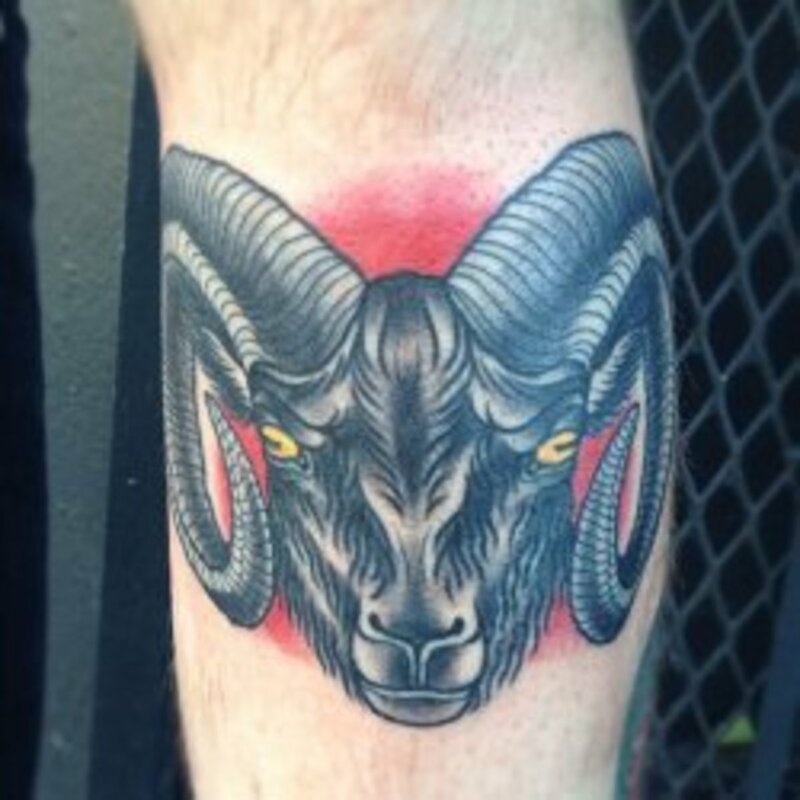 Where is the best tattoo parlor in Sacramento? So... I'm definitely getting a tattoo across my upper back. What about acne? Its not too bad at all, but what's the best thing to do? Planning on getting a champion star behind both of my arms above my elbows. Kind of a family tradition. Had 4th tattoo of a daffodil done last week on my wrist I love it,no pain at all,also had a lovely chat to the tattooist whilst he done it.as for most painful place from my experience it has to be on the achilles tendon which i had a fire breathing dragon tattooed around my ankle,i nearly cried with the pain!!!! Rae your tatto should be fine with swimming,I work as a lifeguard so am usually found in the pool training never had any problems with mine. I plan on getting a tattoo soon, but I am a swimmer so I'm constantly in the water and breaks don't come often. I know it said that you should not but a bandage on the tattoo after you remove the first one, but do you think that a waterproof bandage would help me out since I don't really get breaks and then remove it once I'm out of the water? Hi, im thinkin of getting a tattoo but cant decide where im thinkin between the just next to my hip where the bone outlines the pelvic area and the bottom side of my back, only a small tattoo something like 3 stars starting small, medium and large but not tht big in wich place will it hurt more? im not worried about the pain just wondering, im still going to get it done but i dunno wat id get on my back the stars are for my front area and wat are u meant to do about showering? Hey Justin. As far as pain goes your back is the best and worst place. As some have said here, shoulder blades are very bearable. But as soon as it hits the spinal area the pain is very acute. I believe the reason for that is the resonance the back and forth movement the needle does. As for aftercare. Soap is ok IF there's no scent at all. There's some chemical additives in scents. Any ALL NATURAL ointment will do. Personally I use weber. It's pure vitamin E. Washing 3 times a day and using ointment for 3 days then moisturizing cream for 4 days none of my tattoos have ever scabbed. Around the 4th or 5th day a thin coat of dead skin would simply peel off by itself. The best thing you can do though to let it heal is to let it air as much as possible. Your skin is alive. Let it breathe. Hello everyone. i am 17 and plan on getting a big tribal owl on the upper part of my back. im not bad when it comes to pain but i was just wondering how it actually feels to get on and what aftercare should i deffinitely go with??? im planning on getting a big one by my side by my hip bone, how much will that hurt & how will i be able to shower without causin any problems? i just got a tattoo yesterday first tattoo ever and ive been reading different aftercare tips now im scared because i don't what's right or wrong. i just hope my tattoo doesn't get infected. 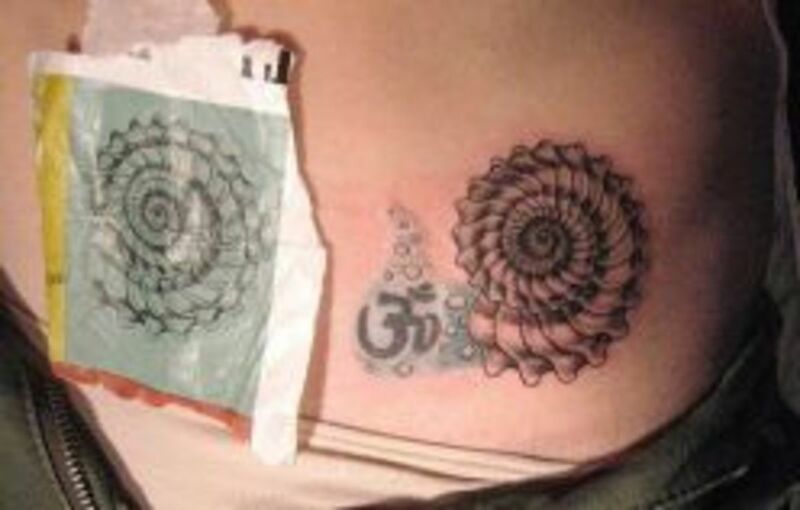 im getting one tomorrow, right arm between my bicep and tricep, u know where it tikles as been touched so i quess its gonna hurt a lot xD don't u agree. I'm glad I found this article. I got my first tattoo yesterday, on the outside area of my foot, and I thought I knew a lot and I thought my artist covered everything about aftercare, but there were minor details that were missed. 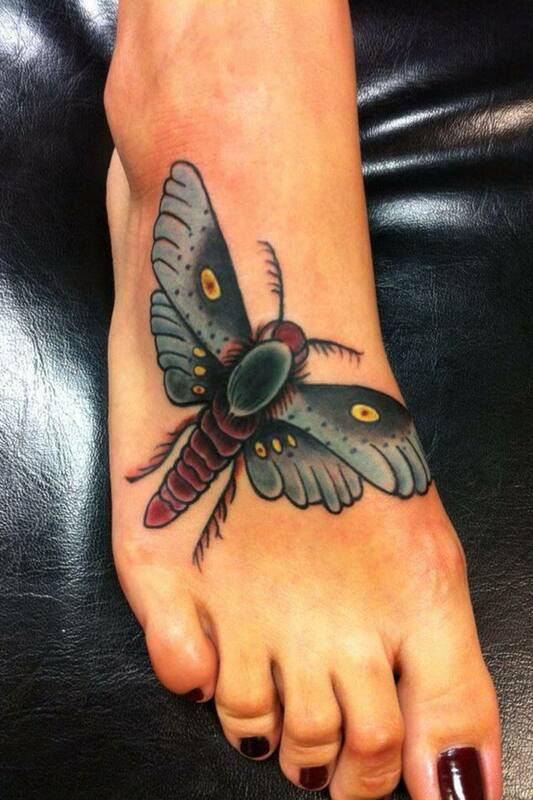 Everyone told me getting your foot tattooed hurts really bad. Yeah, it hurt, but it was bearable. I'd say it was a 6/10, maybe a 7/10 at some points. Not excruciatingly painful. Looking forward to a couple more! I had my 4th and largest tattoo yesterday, the pain was unbearable (on lower back) and I passed out twice! (how embaressing). Good tip for first timers, plenty of sugar before u get started as getting tattooed will drop ur sugar levels. Does it hurt? Yes. Would I go back for another? Yes. After yesterdays 5 hour agony pain getting it done, would I consider another one? Yes! They ARE addictive! Someone also asked about the colour bleeding out for a day or two. Just wash it twice a day at least, very gently and pat dry. Applying a very fine film of the lotion is very very important. If it's still leaking colour on sheets or clothes by day 3 it's prob cos the artist dug deeper than needed. Doesn't affect outcome but if u notice after 2 weeks when it's dried out that some colour patching has occurred, do go back. Most do that sort of touch ip for free. Good luck with it guys!! I have a question, i plan on getting a tattoo on the back of my arms, tricep and back shoulder area. i hope to get it sometime in january, but will i be able to wear a shirt and stuff? and i am very tolerant of pain, that does not bother me. 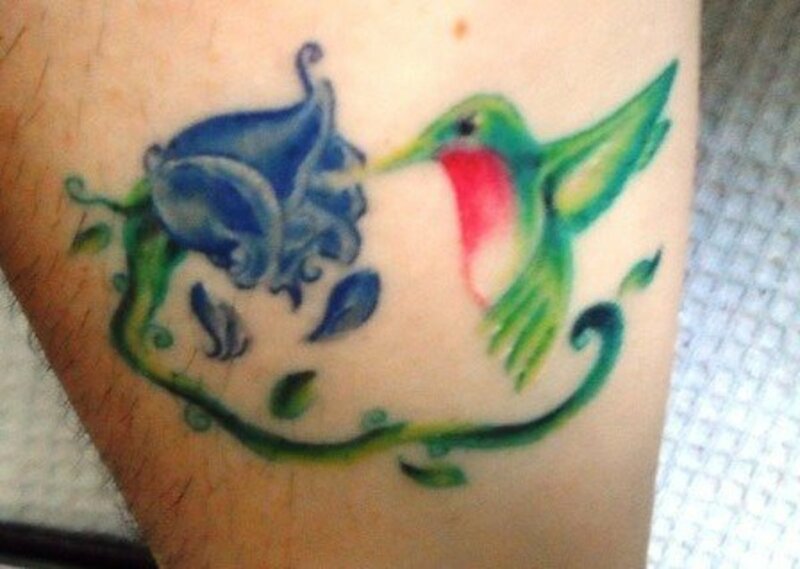 Im getting a Hibiscus on my right foot, it's my first tattoo, its gonna hurt bad? I am going to get a tattoo on my ear (front and back of my ear). How do I keep that out of the water while I'm taking a shower? The pain of getting a tattoo really depends on where you get it and your individual pain tolerance. It's different for everybody. The one I got on my leg and behind my ear didn't really hurt at all. On a 1-10 scale, I'd say a 3 for the leg, a 1 for behind the ear. I just got one on the outside of my foot two days ago and the pain for that one was at least a 7 or 8. For aftercare, I always wash it a few times a day with antibacterial soap, using the method detailed here. Then, for the first 24-48 hours, I put a VERY THIN layer of bacitracin or A&D oinment on it. Bactroban creme also works well. After that, I keep cleaning it as above and put an oil-free, fragrance-free lotion on it. After a couple weeks, your tat should be mostly healed!! Also, DON'T scratch it! It will get itchy, but if you scratch it and/or pull scabs off, it can pull the ink out. Good luck!! just got a my first tatt just wondering how long it takes for the color to stop coming off it? Wear looser clothes, and wear your pants a little lower or higher than usual. getting a tattoo on the side of my hip, to stop rubbing from clothes, what can i do if you suggest not to re-bandage? each shower,when should i stop using it,tattoo not healed yet. Totally disagree with using A & D Ointment or anything like it on a new tattoo. As you said, raw tattoos have to breathe. Those ointments are nothing but petroleums, lanolin, mineral oil - all that smother the wound. And lotion should only be used after it's healed. If you use anyting at all on a new tattoo use something like Tattoo Tonic which is uses tea tree oil and is natural. How long after getting a tattoo on my leg do i have to wait til i can shave my legs again? I had my tattoo 2yrs ago on my back and it didn't hurt as much as i thought...the pain depends on you and your pain threshold, its different for everyone. No. Lip tattoos are different. They fade much different. Lip tattoos heal with your saliva. There's nothing you can really do to heal a lip tattoo but hope it doesn't fade within a few days. If I get a tattoo on my inner lip do these tips still apply..? will it pain while i go 4 tattoo making on my back? Not that I know of. Just make sure that your tattoo artist is aware of this in case he/she has any suggestions. So i want to get my first tattoo on the outside of my foot and I have a really sensitive skin and it tends to scab easily, Is there anything I need to do, to prepare my skin before getting the tattoo.